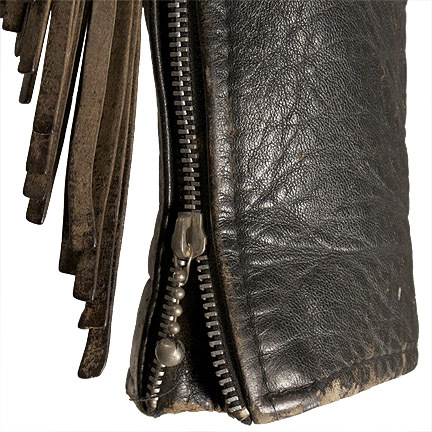 This jacket was worn by legendary rock and roll guitarist Slash (Saul Hudson) of the iconic rock band “Guns N’ Roses”. 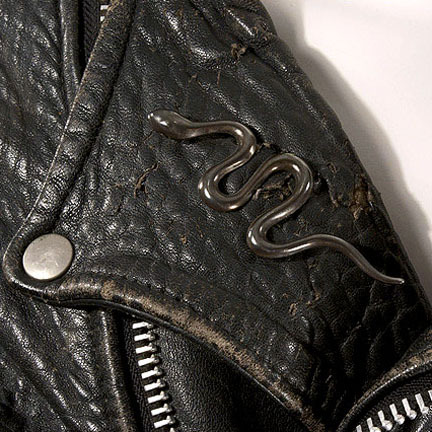 The black leather fringed motorcycle jacket includes multiple zippers and a silver snake pin on the right lapel. The original red satin lining was replaced with a blue satin lining due to extensive wear. Stitch holes are evident in the leather where the red lining was attached. 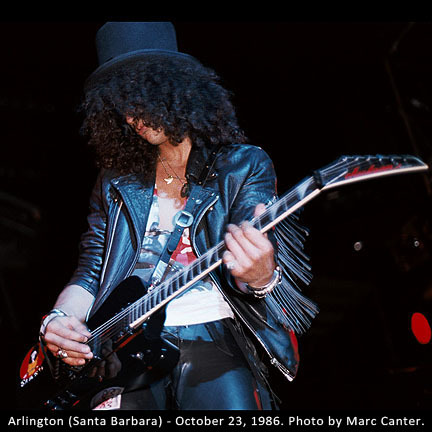 Slash purchased this jacket in early 1986 and wore it during the club show performances prior to Guns N’ Roses signing with Geffen Records in March 1986. 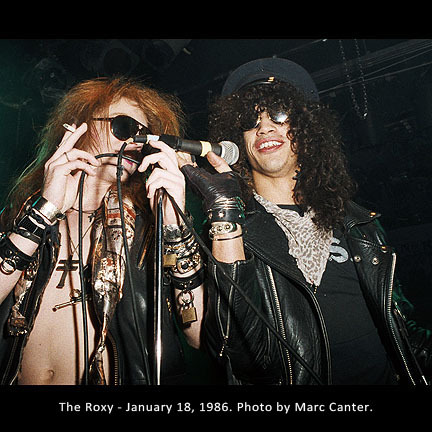 Marc Canter, Slash’s childhood friend, photographed all of the G N’ R club shows documenting their rise to fame. His photographs document Slash wearing this jacket during performances at The Troubadour, Fenders Ballroom, The Roxy, The Cat House, and Arlington Theater. 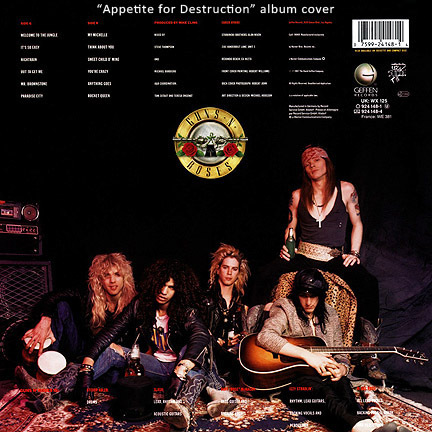 Slash also wore the jacket in numerous promotional photo shoots for the “Appetite For Destruction” album and is featured on the back cover in a photo by Robert John, the band’s exclusive photographer when first signed with Geffen Records. Those images have been printed in hundreds of magazines and featured in other print and digital media outlets for the past 25 years. 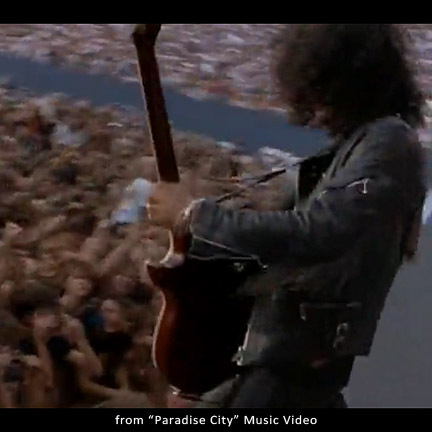 Slash wore the jacket throughout the Appetite For Destruction world tour and while filming the “Paradise City” music video. 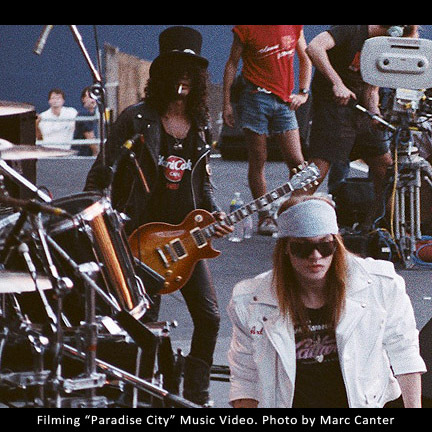 More than half of the video was filmed at New Jersey’s Giants Stadium on August 16th, 1988 in front of 77,000 people, shot by six separate cameras. 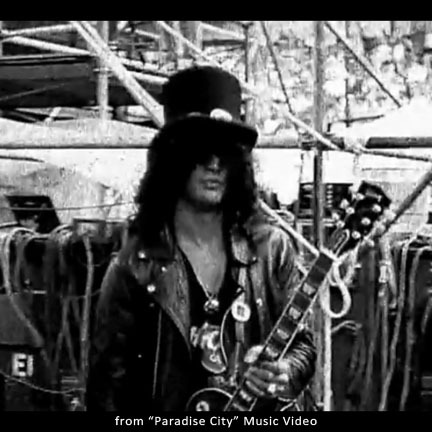 Additional black and white footage was used from their performance at Donington Park in England on August 20th, 1988. 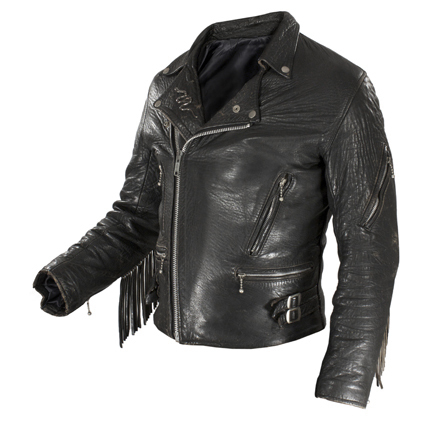 Slash can be seen wearing this jacket during both performances and in behind the scenes shots in the music video. 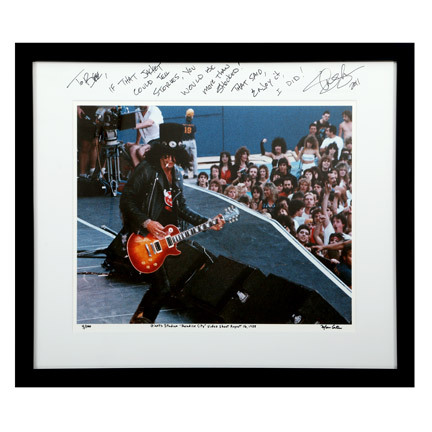 The Golden Closet purchased one of Marc Canter’s photographs of Slash performing in the Paradise Music video. Marc contact Slash on our behalf and asked him to sign the image for The Golden Closet’s owner Breanna Livie. Slash wrote, “To Bree, if that jacket could tell stories you would be more than shocked! That said, enjoy it, I did!”. Slash was also kind enough to share a story about the jacket. 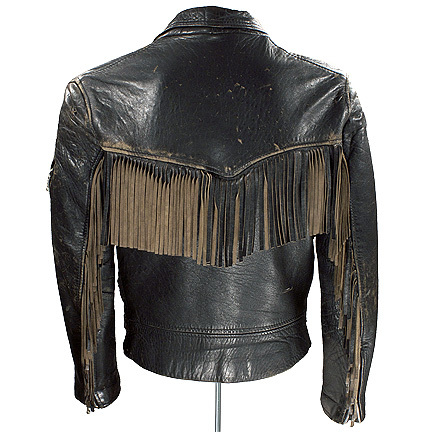 According to Slash, "This jacket was stolen from me one evening at the Cathouse nightclub. My security guard and I tracked the thief down, beat him up, and got it back!” This was Slash’s favorite leather jacket and was worn throughout his career with G N’ R before the band split up. It was in his possession until he sold his personal collection through Julien’s Auction House on March 26, 2011. The item is in good condition with evidence of wear. 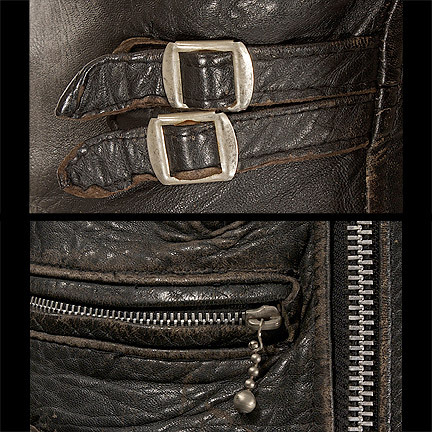 This specific jacket was acquired directly from Slash’s personal collection and is accompanied by a certificate of authenticity from The Golden Closet. 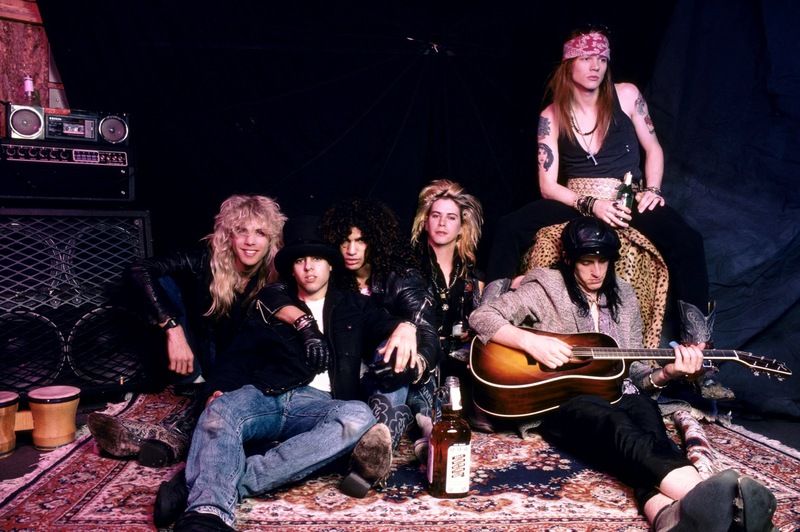 A number of the reference images are courtesy of Marc Canter (CLICK HERE TO SEE Marc Canter with GNR.) and are also featured in his book “Reckless Road, which is a tribute to Gun N’s Rose’s rise to fame. The book can be purchased here.- From the book’s forward: “He’s my best friend; one of the only good friends that is consistent. I can’t nail it down in a word what makes Marc the person that he is — he is just a character unto himself… There isn’t a better person to actually release any material having to do with the coming together and history of Guns N’ Roses, where it went and what was going on behind the scenes.” – Slash.